Attension® Theta Lite optical tensiometer is a compact and accurate contact angle meter for simple measurements of contact angle and surface free energy. The Theta Lite optical contact angle meter is used in a variety of industries such as chemicals, pharmaceuticals, electronics, foods, energy, paper, and packaging. It comes equipped with a manual sample stage and liquid dispenser, making it a convenient basic instrument for routine measurements, educational use, and quality control. The Attension Theta Lite optical tensiometer is uncomplicated, no adjustments needed, ready to perform measurements. Packed with smart features including an automatic disposable tip dispenser to eliminate the need to clean the dispenser between samples. The camera on the Theta Lite optical tensiometer features a camera capable of capturing extremely fast wetting phenomena up to 2068 frames per second and performs exceptionally precise drop shape analyses with 1280 x 1024 pixel resolution. Droplet volume is calculated from the real time image with advanced machine vision to ensure the droplet volume is the same each time to minimize variation. 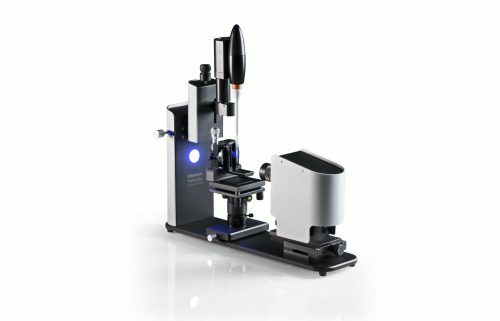 The instrument comes with a manual sample stage and an automated or manual liquid dispenser, making it a convenient entry-level instrument for research, industrial processes and educational use. Theta Lite measures contact angle, surface free energy, dynamic contact angles, surface tension and interfacial tension. Advancing and receding contact angles can also be studied automatically or manually. Contact angle measurements are important in many areas of research and quality control where surfaces with different wettabilities are often utilized. Contact angle is one of the most sensitive of all surface analytical techniques since already the top nanometer of the surface influences wetting behavior. Contact angle and surface free energy measurements are commonly utilized as a simple and fast measuring technique when studying surface heterogeneity and cleanliness. Attension Theta Lite optical tensiometers use a source of cold monochromatic LED light and a smooth lighting integration sphere that reduces sample evaporation. High image quality is guaranteed with a high-resolution digital camera and rapid data transfer between the computer and the instrument. energy studies. The automatic double liquid dispensing can be used with disposable needles as well with an adapter to measure dynamic contact angles. Automatic baseline detection and drop shape fitting. Measuring chambers, cuvettes and other accessories are available to add capabilities to your Theta Lite.